 • A profile of your work and qualifications with a photo of yourself for use in theclass bulletin• Detailed description of the class (project, skills required, skills taught, etc. )with a photo of the project, if applicable• An advance list of tools & materials that will be used in the class. 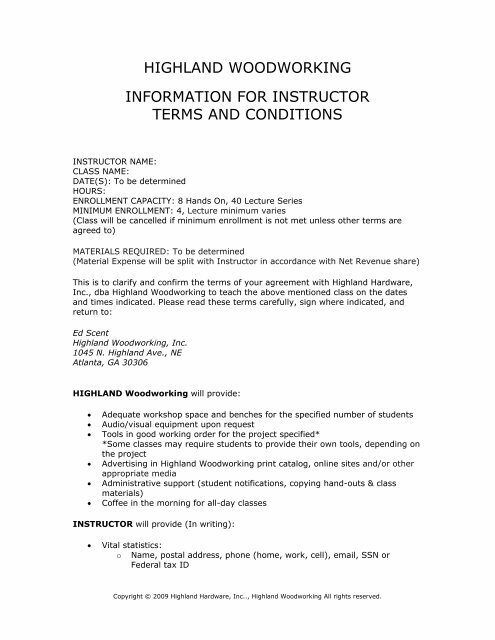 You shouldsupply this information at the time the class is scheduled, and should includean itemized material list including costs estimates• A comprehensive list of supplies Highland Woodworking needs to supply foreach student• Supplies for the project (unless other arrangements are made with HighlandWoodworking)• Prep of stock (unless other arrangements are made with HighlandWoodworking)COMPENSATION• Instructors receive 40% of net revenue collected for class enrollment OR aprearranged fee• Material Expense will be split between Highland Woodworking and Instructorin accordance with the revenue share ratio• The following expenses may be pre-approved for travel reimbursement withcost estimate:o Estimated round-trip coach airfare, or standard mileage @ .38 per mileo Hotel (1 night per half-day course, 2 nights per full-day courseo $25 per diem for meals• With prior approval, the instructor will be reimbursed for Instructor materialexpense share for Instructor-purchased materials with submittal of originalreceipts• Payment terms are net 30 daysCANCELLATION POLICY• Highland Woodworking reserves the right to cancel any class at any time forany reason. This is most commonly a result of inadequate enrollment. In anycase, we make every effort to consult with the instructor for consensus priorto taking this step.• If the instructor must cancel for cause, the instructor should notify HighlandWoodworking as far in advance of the beginning of the class as possible.ADDITIONAL INFORMATION• The instructor should be present in the classroom in sufficient time prior tothe beginning of the class to be fully prepared.• Please allow 15 minutes at the end of each class day for students tostraighten up the area and return tools to their proper place.• Any projects made by the instructor during the class with materials providedby Highland Woodworking will remain the property of Highland Hardwareunless other arrangements are agreed upon in advance.• Instructors should refrain from making disparaging remarks about anyproduct, brand, manufacturer or competitor in the class.Copyright © 2009 Highland Hardware, Inc.., Highland Woodworking All rights reserved. • The instructor is allowed to sell his/her product in the class (videos, books,antique tools, kits specific to the class, etc.) only if these items are NOTcarried by Highland Woodworking.• Instructor products will be sold through the retail system at HighlandWoodworking.• Highland Woodworking will retain 20% of revenue realized from items sold onbehalf of the Instructor.• All classes will include instruction on safety. This should cover general safetyprocedures (see below) and specific procedures appropriate to the tools &materials in use during the class.GENERAL SAFETY: KEY POINTS TO DISCUSSoooUse of safety glasses, hearing protection and any other necessaryequipmentLocation of:• First aid kits• Eye wash station• Fire extinguisher• Emergency first aid panelRendering aid:• If emergency call 911 immediately• See emergency first aid instruction panel and take appropriateaction• Summon staff for assistanceSPECIFIC ARRANGEMENTS REQUESTED FOR THIS CLASS:Photo Release:I hereby irrevocably authorize Highland Hardware, Inc., dba Highland Woodworkingto copy, exhibit, publish or distribute any and all images of me for purposes ofpublicizing Highland Woodworking programs or for any other lawful purpose. Inaddition, I waive any right to inspect or approve the finished product wherein mylikeness appears.Please sign and date below to indicate your agreement to the terms of thisdocument.SignatureDateCopyright © 2009 Highland Hardware, Inc.., Highland Woodworking All rights reserved.